The political and social unrest in Ukraine has been in news headlines since late November 2013. The situation has rapidly deteriorated, culminating in the death of an estimated 80 people. The entire world has watched a country tear itself apart. The media continuously publishes images of a capital city burning to the ground. After interviewing Roksolana Luchkan, a first generation Ukrainian American about the unrest in Ukraine, we at the WACCT have a better understanding of the reasons for the unrest, the Russian involvement, and the hopes of Ukrainians around the world. Roksolana is a first generation Ukrainian American. Her parents and grandparents escaped the terrible conditions under Soviet controlled Ukraine during World War II, and fled to the United States. They escaped from a Ukraine suffering under oppressive Soviet Russian political conditions. Over the years, Roksolana has visited Ukraine many times. On her last visit about 5 years ago, she noted economic and social developments and a more westernized populace and country. Ukrainians were strengthening their relationship with the west, and thriving as their country developed. Then in November 2013, the stirrings of unrest began under the leadership of President Yanukovych. The source of the unrest in Ukraine began after the President’s cabinet announced their decision to abandon an agreement that would strengthen ties with the European Union, instead of ties with Russia. Opposition unrest began that very night, November 21, 2013, as hundreds of protesters gathered in the streets. That same week, over one hundred thousand people gathered to protest the decision, notable for being the largest protest in the Ukraine since the Orange Revolution in 2004. Later in November, police began rounding up and arresting protesters. The situation began to gain rapid media coverage when images of injured protesters, alluding to police brutality, began to be circulated. As police brutality and heavy weaponry were used against the peaceful protesters, the situation turned into a human rights issue. Roksolana attributed the explosion of media coverage to this. She explained that Yanukovych called in the Burkut – a special forces militia – to quell the protests, which turned Independence Square, Kiev into a violent scene. Protests continued in December, with protesters occupying Kiev’s City Hall and turning Independence Square into a tent city, similar to the operations set up by Occupy Wall Street in New York City, US. Over 800,000 people attended the protests. Later in the month, Russia stepped in economically, offering to relieve Ukrainian debt and reduce gas prices to the suffering nation. Russia’s decision to help seems warranted yet simultaneously ironic, for increased political pressure to abandon the plans to strengthen ties with the European Union came from Russia. For a timeline of recent Ukraine unrest, click here. Protests continued in December and January, though the situation was relatively stable in the politically shaken country until late January. In an attempt to quell the upheaval, the Ukrainian government passed strict anti-protestation laws. Consequently violence broke again, with the first two deaths of protesters on January 22. After, Ukraine’s Prime Minister Mykola Azarov had had enough, and resigned his position in the unstable government in late January. Roksolana likened the 2014 anti-protestation laws to Soviet era limitation on freedoms, which is frightening 60 years later. Late January and early February become a time when Kiev City Hall was in a transitional state of occupation, evacuation, and re-occupation as oppositional groups changed their conditions again and again. The violence increased until in late February the death toll was estimated to have been at least seventy seven people, including police and civilians. A truce was attempted, then abandoned, much like the agreement that sparked the unrest. It is hard to imagine how a large, relatively stable European country could have erupted so immediately into chaos. To attribute the unrest to a single cause would be too simple, however it is safe to say that such a situation occurred because of the precarious role that Eastern European countries play. The unrest in the Ukraine is a great example. Currently, Eastern Europe finds itself in a stage of regional confusion: the countries are no longer in the Russian sphere of influence, but are not considered “Western European” either. Many countries, like Roksolana explained with Ukraine, are westernizing. As countries such as Ukraine – long independent nations – move forward, they distance themselves from Eastern Europe, namely Russia, and inch towards Western Europe, namely the European Union. 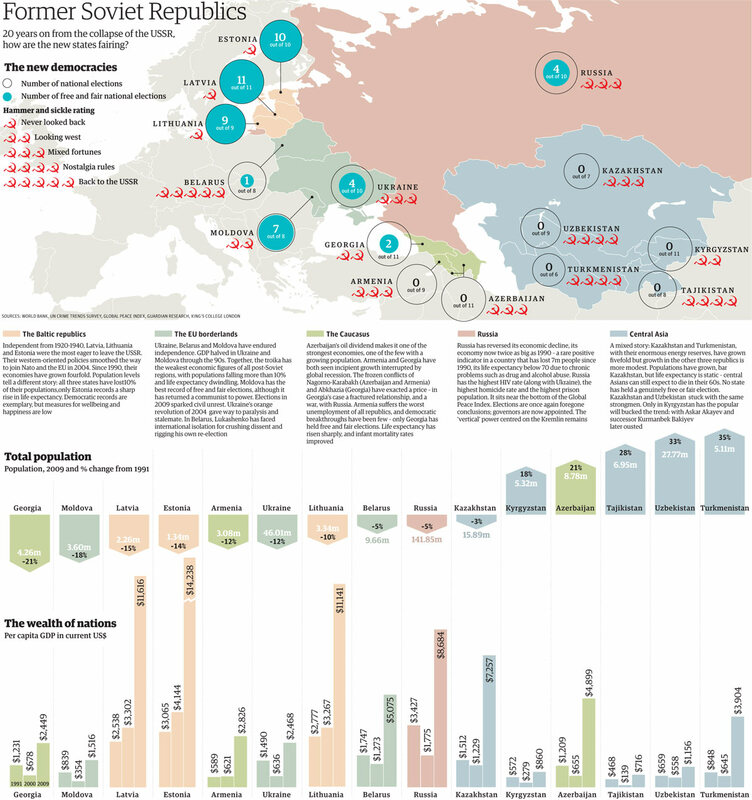 Former Soviet Socialist Republics Statistics. Many former USSR countries maintain their strong ties to Russia like the “Stans” of the Middle East, while many distance themselves from their previous Communist affiliations. To visit original infographic article at The Guardian, click here. Ukraine is simply the first country to have experienced this regional confusion so publicly and violently. And in a situation that such a clear line can be drawn to Russian influence. The spark was when Russian supported Ukrainian President Yanukovych and his cabinet decided that it would be better for Ukraine to abandon its plans to gravitate towards the European Union, and instead revert to Russian connections. The USSR was influential but in the years since the fall of Communism and the Berlin Wall, Russia’s influence has decreased to only a fraction of what it once was. Though Russia’s power decreased, it remained influential, and there has been a resurgence of Russian power. The resurgence of Russia’s influence is, at the least partially, to blame for the situation in Ukraine. Developments have been occurring rapidly as the situation continues. The protests, the violence, and the actions of Ukraine leaders have all come as a surprise. So who can know what will happen next? Roksolana is hopeful for Ukraine. She hopes that there will be free elections – like the protestors are demanding. She hopes that these elections will run smoothly, without Russian or Mafia influence like the election of President Yanukovych. Though some worries do still exist, Roksolana is hopeful that the populace will know enough about new political candidates to cast educated votes for future leaders. Roksolana mentioned many times that she, like Ukrainian diaspora around the world, support the protesters and hope human rights and freedom succeed in Ukraine. Special thanks go to Roksolana Luchkan for sharing her experience and opinions. For more on the conflict in Ukraine, read a blog by WACCT member, Vaira Paegle.